It’s a delicate moment, when someone is no longer felt to belong to the present, and slides away to become part of the past. It is a tricky moment when one stops being inside critique and becomes part of history. Today’s historians, I somehow feel, tend to flatten things. This is the present risk of Aldo van Eyck’s contribution to 20th century architecture. I do not want him to be already historicized! There is still some time left for that to happen! Many of the problems he highlighted and against which he fought with blood and tears are still there, and still represent a threat to the soundness and intelligence which today’s architecture should convey. The shouted modernism of today, of which there are eloquent examples in my home country Italy and in my host country the Netherlands, is – maybe – a novel declination of the freewheeling modernism and of postmodern pests which he virulently attacked. Today, I feel, criticism is really too quiet! Today no one seems to comment, let alone criticize, the work of colleagues, and in this I smell a mix of indifference, cynicism and what-the-hell attitude vis-a-vis our surrounding world. When there is some criticism today, this is carried out with such tact and politeness, as to be utterly un-offensive, let alone acting as a starting point for a serious discussion. In Van Eyck’s highly participative theory and praxis of architecture, there is no pretending, no simulation, no illusion, no hide-and-seek attitude, and I think this is what makes it still pertinent today. It is well known that Aldo van Eyck was not quiet or indifferent, both to persons and things. To his credit, he preached relativity but honestly did not practice relativism. Equally often, I must say I agreed and disagreed with his points of view, but this is beside the point. Given today’s cultural climate, the facts that he travelled with a purpose, read paying attention to each word and wrote extensively, drew and designed things at their appropriate scale, is for me of growing significance. With regard to this, I think his personal house in Loenen a/d Vecht, south of Amsterdam, stands out as a delightful coming-together of many of his moral, cultural and material preoccupations. Like in John Soane’s – an architect – house in London, or Mario Praz’s – a literature historian – flat in Rome or the reconstructed Constantin Brancusi’s – a sculptor – studio in Paris, also in the Van Eyck house everything seems to come together by way of imagination and vision rather than by way of just functionality and need. The many treasures the house contains have to do with personal conviction, with the idea of a private universe and with sheer pleasure, and these have in turn to do with his founding idea that architecture should be something revered, something convivial and sensual, at the same time. His house in Loenen is also where the Van Eyck Foundation is based. Santa Maria Formosa is a church in Venice, northern Italy. It was erected in 1492 under the design by Renaissance architect Mauro Codussi. Aldo van Eyck was, quite simply and straightforwardly, an architect. There is not much to add to this. The fact he was also a builder, a thinker, a writer, and possibly an anthropologist, a photographer and a humanist, should be seen not as weakening the notch of the matter, but, the opposite, as a proof of his seriousness and conviction that architecture is the wonderful melting pot of an array of disciplines and stimuli. For him, architecture should take risks and open itself up to culture, to literature, to painting, to human dramas and speculation. Understandably, for some it’s hard to understand how on earth he could bring together under the same cosmogony such different things as Mondrian and the Dogons, or Louis Kahn and Mauro Codussi. All I can say is: let’s just accept this and see it as part of his intellectual generosity. Architecture for him should never be a reduction, should never be an academia, should never be a theory or just a number. This is why he criticized head-on the mechanism of Gropius’ CIAMs, the caricature historicism of Aldo Rossi, or the hi-technology of Piano and Rogers, Sure, his frankness in saying what he did not believe in, did not facilitate his life as architect, but made it harder. The fact he was never part of a culture of consensus, maybe isolated him too. Some architects-colleagues and architects-friends considered him to be rather erratic and dispersive, un-predicable, and un-interested and un-able to address issues such as mass-production and big-scale. He was at times considered to be a bit of an anarchist, a rebel … The truth is that actually Aldo van Eyck never considered or wanted architecture to become something abstract and distant; for him architecture was – or rather had-to-be – something very real. Reality for him meant designing in a tangible, careful and intense way. I hope and I think, this seminar will try and put this message across. A lot can and should be said about Aldo van Eyck’s involvement with architectural theory of 20th century. His notes and writings. His distant travelling almost in every corner of the world. 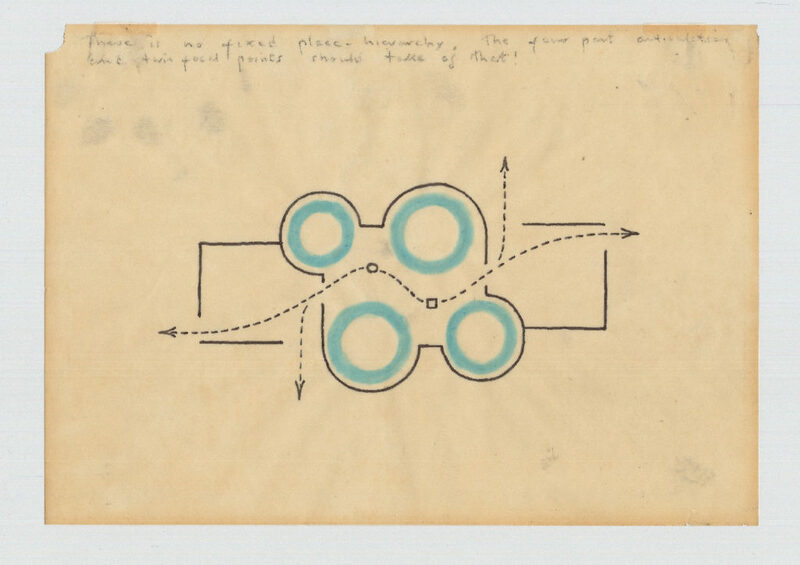 His schematic but eloquent diagrams such as the Otterlo Circles, His active role within Team 10 against the International Style. His crisp understanding of the shapes and colours of things. His rather platonic love-affairs with anthropology and poetry. 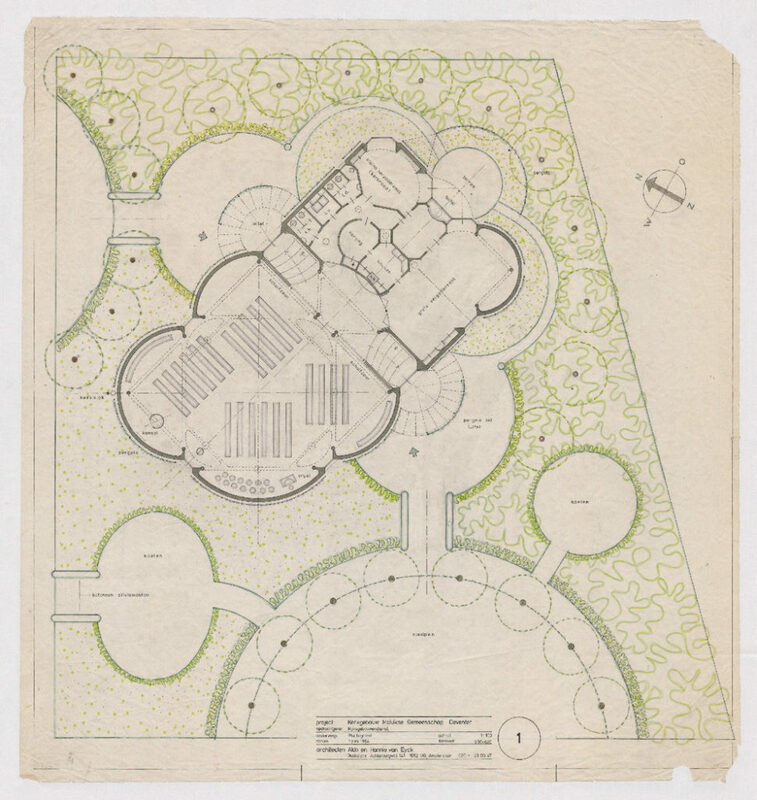 And, last but not least, his optimistic formulations of why architecture should relate to play, to mathematics and to the artistic avantgardes of the 20th century. Well, all these aspects – I believe – are subsidiary to the stupendous atmosphere and quality of his realized buildings. My favourites are the Church in Den Haag, the blue Church in Deventer, the Sonsbeeck Pavilion, and the Mother’s Home in Amsterdam. Even if Aldo van Eyck was not at all fond of the idea of monument (this was a much-debated topic after World War II, as an understandable reaction against Fascist and Nazi architecture), now, twenty years after his death, I think we should all relax, take a deep breath and openly discuss whether we consider his buildings to be monuments, of a special and unique kind of course. Well yes, I think some of his buildings are very special monuments, and I think they should be treated and looked after as such. Some buildings end up being considered monuments because of the scale and symbolic message they convey; but other buildings can be considered monuments because of their ideas and poetic beauty. Aldo van Eyck’s buildings are anti-monuments in terms of scale and size, but are hyper-monuments in terms of refinement and preciousness. Churches, in our society, have better chances to be considered monuments than other more prosaic building types. Even if increasingly often I find myself visiting churches which have inappropriately been turned into meeting rooms, sports halls and tea houses, with hideous missionary posters, messy kid-drawings and cheap spot-lights. In many churches, sadly the religious and spiritual dimensions seem gone, kaput. 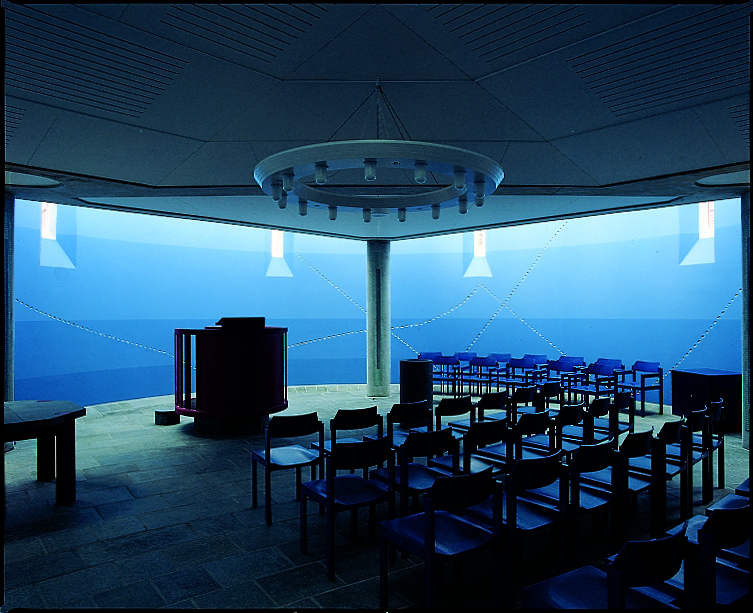 In his lifetime, Aldo van Eyck designed three, but built only two churches. The spiritual ethereal dimension seems nevertheless to be present in many of his buildings, regardless of their actual function, which is to say that spirituality emerges as a fil rouge, as a leitmotiv in much of his work. He was in no way religious as a man, but I think he was spiritual as an architect. Many of his works convey a universal aura, in a sense primitive and elemental. Wherever he went, he would pay homage to the “emptiness” of those buildings and spaces whose purpose went beyond their straight functionality. The three churches he designed combine a sort of “open space” in plan with a sort of “closed space” in section, and this, I think, produces very special sensations. And in a way, sums up also the opposite pulls Van Eyck felt, one towards the light column grid of modernity and one towards the solid walls of the past. 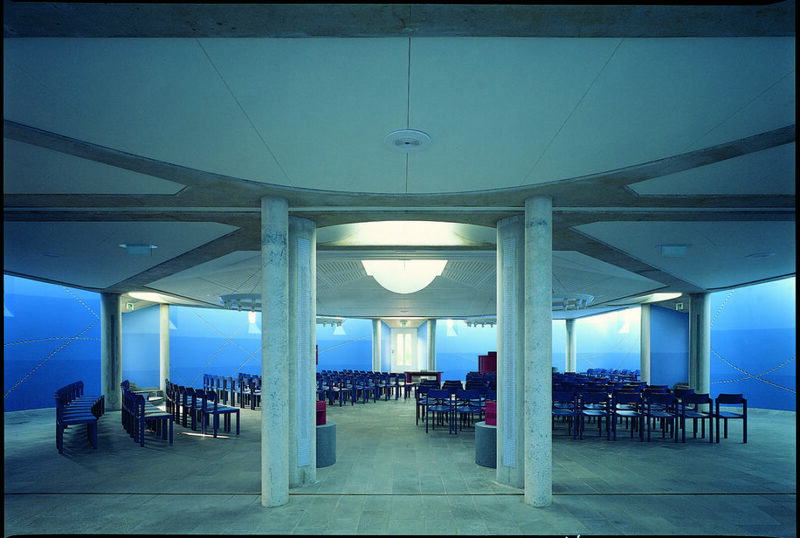 Aldo van Eyck’s Church in The Hague of 1965 dialogues happily with other church examples of the post-war period which adopt a simple yet expressive concrete tectonics: Le Corbusier church at La Tourette of 1960, St Anna in Dueren by Rudolf Schwarz of 1956, Figini e Pollini’s Madonna dei Poveri in Milano of 1954, Giovanni Michelucci’s motorway church in Florence of 1964. Van Eyck’s Hague Church, almost catacombal in spirit, conveys well the idea of poverty and the effect of shelter. 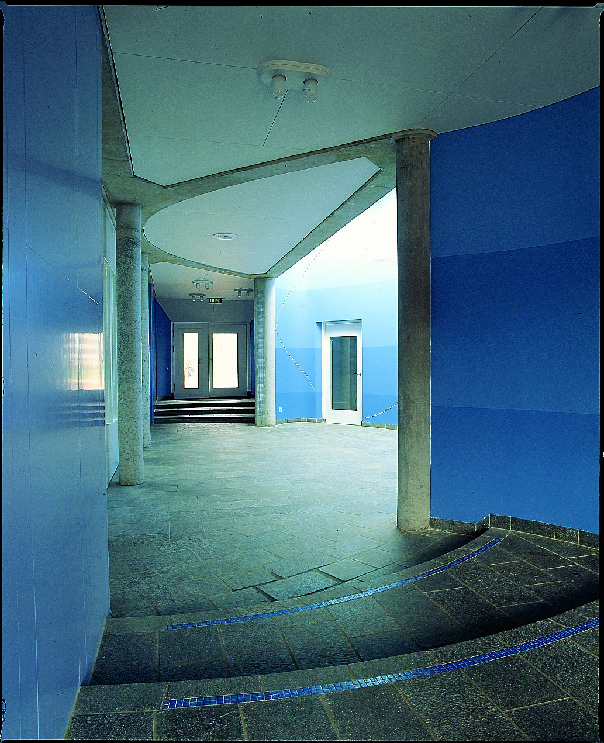 The Moluccan Church in Deventer, completed in 1990, is only one floor high but yet produces a strong and rather exotic spatial effect; the inside space is drawn by swollen concave walls with different radiuses, which have a cobalt blue colour, washed by the Dutch sunlight filtering through lovely rooflights set against the ceiling edges. 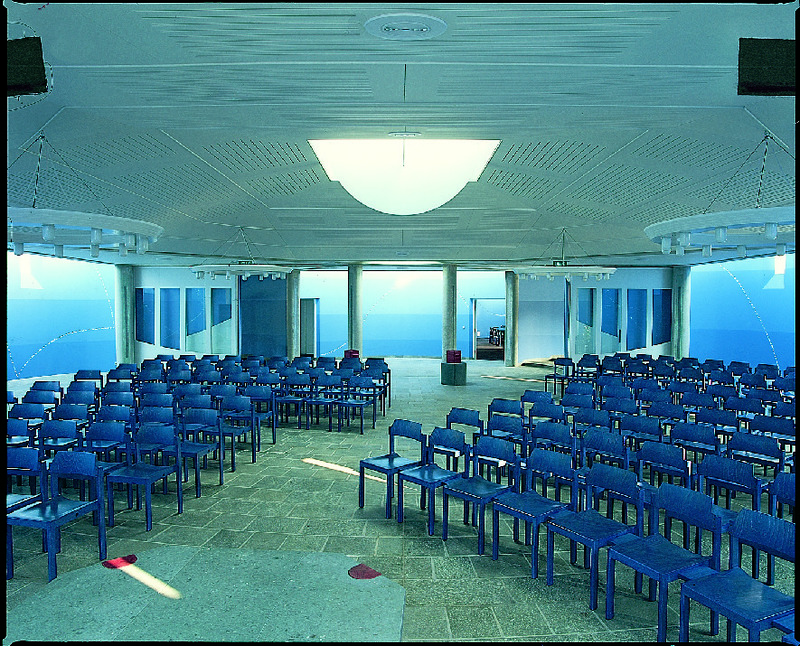 The church provokes introspection and amazement, as if one were underwater or up in the clouds. “Wheels of Heaven” is the appellative given to the third church, the un-built one, same year as the one in The Hague; the many sketches and drawings of this project seem to glorify the power and the mystery of the wheel/circle, with regard both to its geometry and the association between the circle and human assembly. 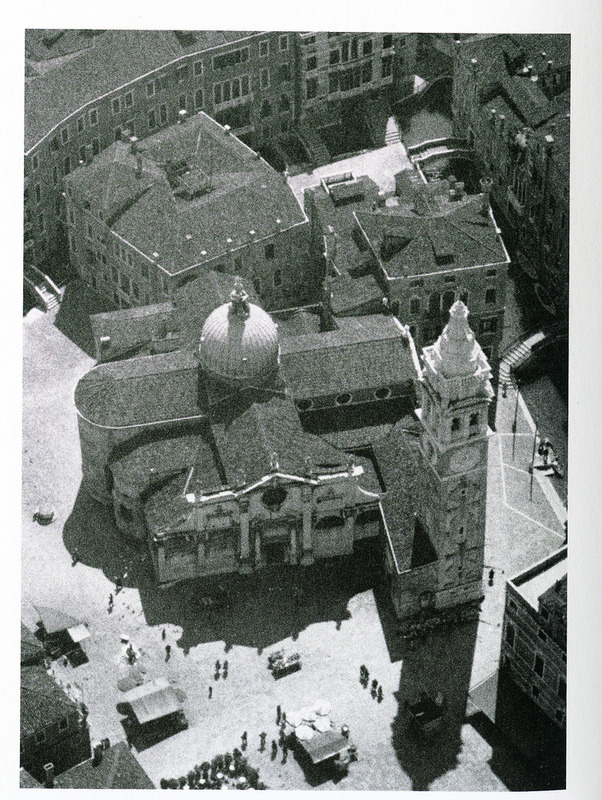 The circles making up the church have massive campanile-like skylights, and there are two square courts at either end. 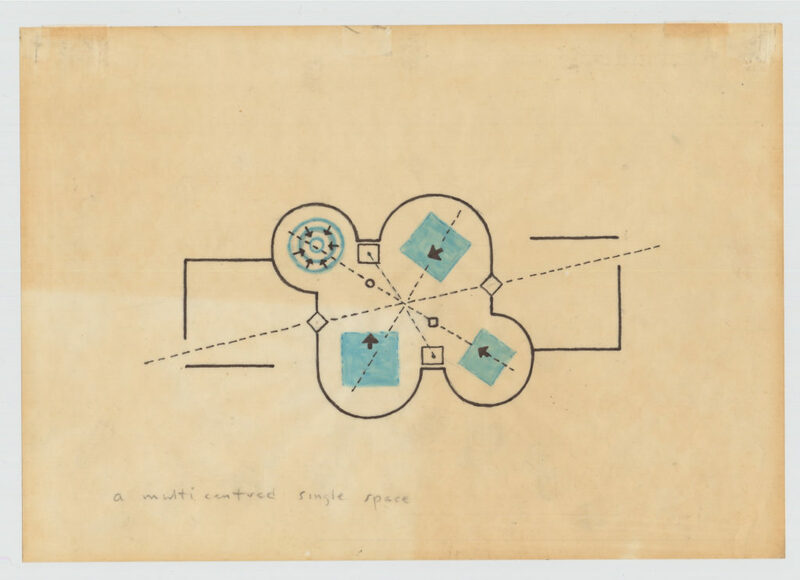 For Aldo Van Eyck, the circle was not only a sacred geometrical shape and an allusion to the very idea of community, but – I suspect – it also summed up well his round, fluid and uninterrupted idea of the transience of time. How did Van Eyck position himself in relation to the historical time he lived in? Unlike most positivist architects in the ‘50s and ‘60s who struggled to be at all costs conventional, modern and progressive, Van Eyck’s scope was totally different. He was – as I think Vittorio Gregotti rightly put it – undisciplined, a bit of a brat one might say. He was neither conservative nor an avantgardist. He was neither modern nor nostalgic, neither local nor international. Or, come to think of it, he was all of these things at once and together. Van Eyck never struggled or shouted to be recognized as a maestro. But then, what was he really interested in? Throughout his life, I think, he tried to focus primarily on architectural quality. Design shortcuts, economic scapegoats and thoughtlessness in general drove him really up the wall. I remember a rather scary scene outside the Mother’s Home in Amsterdam; Aldo turned wild because the rubbish bins, for which he had designed a proper place, had been stored in the wrong place. For him architectural quality meant: social awareness, good details, imagination and patience. He was not prolific. 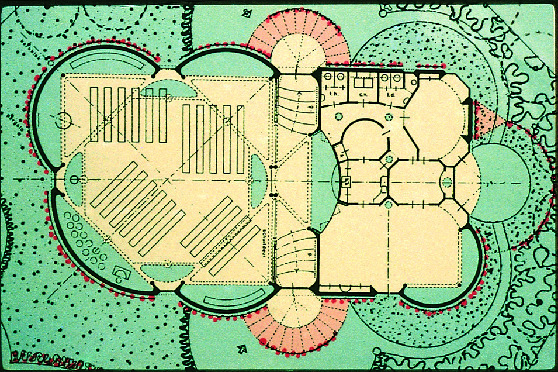 Architects – according to him – should not lie to themselves about the complexity of the world. Because of his absolute dedication to absolute quality, I find it somewhat hard to position his work in relation to time and place. Because of the quality of his buildings, I find it in a way un-interesting to highlight what came before and what came after him, or what his background context was. Van Eyck’s work seems, in a way, to be impermeable both to geography – meaning the place – and to history – meaning the passing of time. With regard to geography, in spite of the fact that he spent his early family days in London and study days in Zurich, he was passport-wise a Dutchman, and by choice once World War II ended he became first a central and then a suburban Amsterdamer. Personally, I remember him as an open-minded European citizen, spanning easily the cultural distances between the northern and the southern shores of the continent. I never think of Aldo van Eyck as belonging specifically to Holland; his relatives and kins are scattered here and there in a haphazard and at times contradictory way. As an architect he picked up ideas and stimuli from Indonesia, Africa, the Far East, the Mediterrenean basin, New Mexico and Scandinavia. In Aldo’s hands, the architecture world heritage seems to coalesce into a kind of giant field of intuitions and design opportunities. In a way, he was very eclectic! I remember him once in Milan, saying that a facade by Bramante reminded him of a facade by Soane. What a wild comparison, I thought then, but of course he was absolutely right. With regard to history, his crucial formative years were the ones between the 1950s and 1970s; his roots sunk in the crisis of Modernity of those years, a crisis he sure wanted and fomented. But then, how really close was his thinking to the common paradigms of that period? Team 10 was a rather loose club of very active and rather angry individuals who had clearer in mind what they were against rather than what they were in favour of. Today, chaps such as Peter Smithson and Giancarlo De Carlo are remembered more for their words than for their buildings. 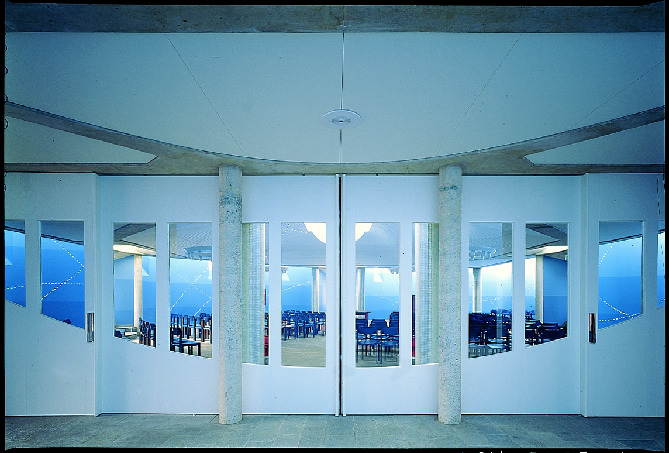 Others, such as Oswald Mathias Ungers and James Stirling, seem to have fallen in the category of the post modernists. Aldo van Eyck was, I like to think of him this way, a bit of a solo in the Team 10 context, like a solitary pawn occupying a powerful position in the middle of chess-board, exposed yet un-attackable. His unique critical position stood between anthropology, pedagogy, internationalism, history, poetry, and the avantgarde. Let’s take as an example the Orphanage, completed in 1960 and still considered today to be his Political Manifesto and his Precious Masterpiece. 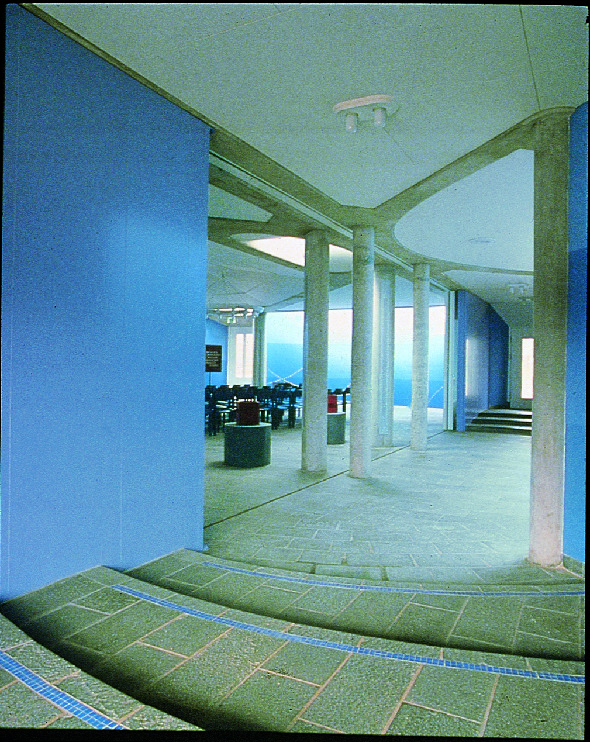 If one was asked to spell out the influences of the Orphanage, one would probably start from the many Dutch so-called structuralist buildings, first and foremost the Centraal Beheer in Apeldoorn by Herman Hertzberger. And then one would amplify one’s perspective, so as to include some significant overseas buildings by top architects of those very years: Kahn in Philadelphia, Coderch in Barcelona, Candilis Josic Woods in Berlin, Correa in Ahmedabad. But still, I truly feel that none of these buildings touched the same polemic and poetic chords as the Orphanage did, because they all stopped short at a basic morphological and organizational level, and avoided venturing in the dangerous terrains of human empathy and psychology. The poetic and intellectual level of Aldo van Eyck is what makes him difficult to grasp and discuss even today, and that’s why I think we are all here. Aldo van Eyck never really believed in the shortcuts of progress nor in the associated concepts of bigness, speed, and efficiency. He was a benevolent sceptic in this respect, but he was also volcanic and generous in putting across innovative solutions and ideas. Those who believe he spent most of his time thinking and writing, are only half-right. In fact, he spent most of his time designing special buildings.